The main venue is the Centara Grand at Central Plaza Ladprao Bangkok, located in an ambitious urban business district of Ladprao under one roof with Bangkok Convention Centre and Central Department Store, with easy access to Skytrain and MRT subway. 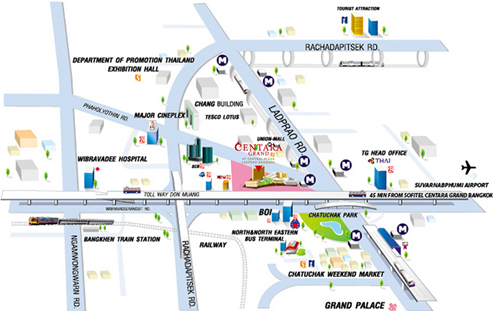 It is only 35 minutes from Suvarnabhumi Airport, 15 minutes from Don Muang Airport and City Centre. 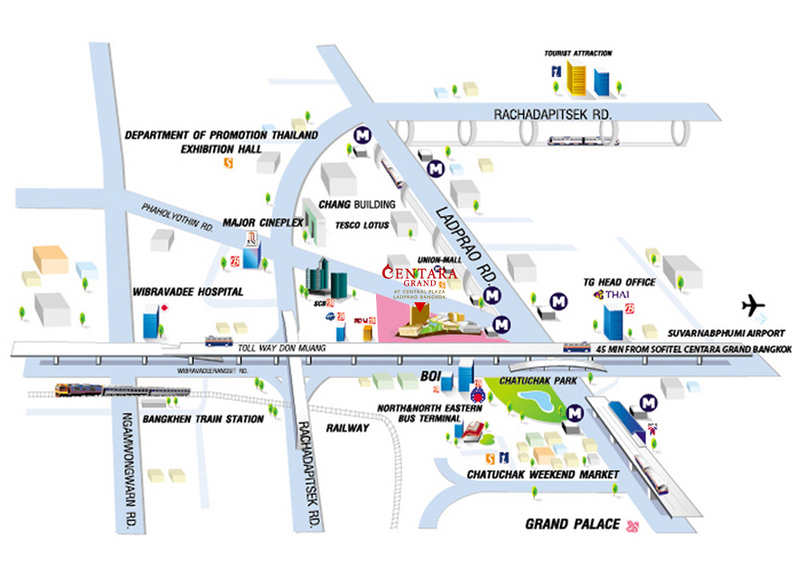 Accordingly, it is opposite a famous Chatuchak Park and Market. Their meeting, banquet, convention, and exhibition facilities are unrivalled. A wide range of meeting and banqueting facilities are offered large or small social events and private parties. With 20 superb function rooms, a total function area of 7,000 square meters can be accommodated from 10 to 3,800 guests. This self-contained facility has been acclaimed as the premier convention venue in the region for hosting international events. All international passengers will arrive at the 2nd floor of Concourse Building of the Suvarnabhumi International Airport. Passengers will need to pass through the immigration procedure and collect baggage from the baggage claim area, before entering the hallway. From here, passengers should follow the 'Public Taxi' signs in order to reach the Taxi Service area located on the curb outside the building on the first floor. Here passengers will find a queue for the Taxi Service Counter. For a more convenient and higher fee, limousine service is available with counters present inside the terminal.